Manual or Electric Speed adjustment. B3,B6,B7,B8,V1,V3,B5,V5, &V6 mounting positions to suit your needs. Smooth speed adjustment running or static. Preferred by finest machines in the world. Varmec s.r.l. VAR dry traction variators remains the benchmark for silent, smooth, reliable mechanical variable speed on pumps, conveyors, mixing machinery, and top brands of band saws, wood working machinery, finishing equipment, and machine tools requiring its near ideal transmission characteristics. Simple to operate, "stupid-proof" is not an unusual description, and so trouble free that most owners have no idea how it operates or where to get another or a spare part should one ever be required. 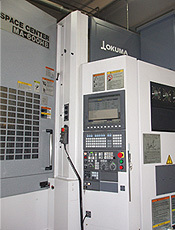 TVT America is North America's service & support center for the Varmec VAR, but very little sales are made for parts, a very infrequent Graphite Drive Ring2 (below) is occasionally required for older models or ones with untold hours of operation, like any gearbox those with helical secondary reduction (which 1,2, or three stages are available) will require infrequent oil changes (12,500 to 20,000 hours...2-5 years) and eventually a new oil seal on the output shaft. Unlike Variable Frequency Drives, the VAR has no finicky electrical needs, just a motor, and no computer programmer from the Nerd Squad is needed to set it up. Yes, you can buy a more complicated device to vary speed, but probably not a better one. 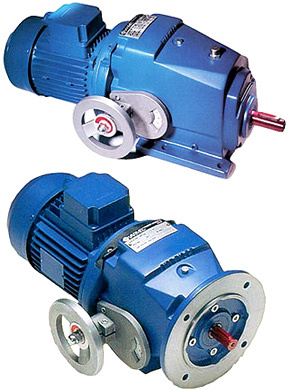 Power is transferred via friction between the Cone1 at input and the Drive Ring2 which leads to the output5 (either directly or through 1, 2, or 3 stages of helical gears). 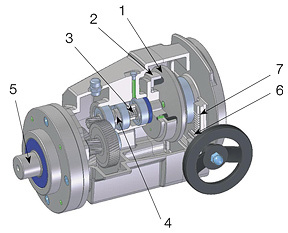 Pressure between the Cone1 and Drive Ring2 is maintained in proportion to the output torque load via a Dog-Clutch4 cam. A Spring3 inside the transmission shaft exerts a low contact pressure between the Cone & Ring during no-load or idling, which also allows speed to be adjusted while static or when in motion; this is a significant design advantage over other variator types. Speed variation is achieved by movement of the motor, on linear guides via a rack7 & pinion6 which is driven by the speed control handwheel or optionally by an gearmotor drive system developed for electric remote control of the VAR.